is a project by ESKYIU, Marisa Yiu and Eric Schuldenfrei, with co-curators Alan Lo and Frank Yu in West Kowloon Cultural District, Hong Kong in 2009-2010. ESKYIU is a multi-disciplinary architecture studio that explores how Architecture intersects with transformative cultural landscapes, media, products, print, experimental fabrication systems, educational tools and social sustainability. The Community Lover’s Guide to the Universe is a growing collection of stories and book editions, bringing together the experiences of many amazing people and their innovative projects – people who are actively and creatively making community, together. Each book is produced collaboratively, and focuses on a particular place or theme. The website is a wider collection of stories, blog posts and reflective essays on this emergent new community culture. The aim of the Community Lover’s Guide is to surface and share this new community practice widely. European Alternatives is a transnational civil society organisation and citizens movement promoting democracy, equality and culture beyond the nation state. The nation state is neither the appropriate political form in which to define democratic decision-making and active citizenship, equality between people, the respect and extension of rights nor the appropriate political form to promote a responsible politics for the environment, ensure political control over the economy and an equitable distribution of wealth, or promote peace between people. European Alternatives seeks to promote alternative forms of political subjectivity and collective political action. is an independent think tank based in Leipzig, developing and spreading new concepts for an economy oriented in social and ecological values. 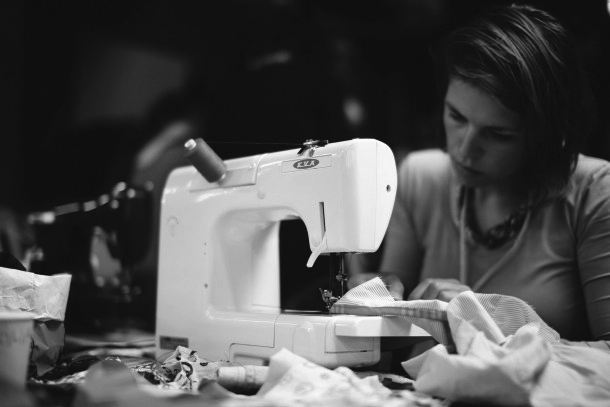 is a project and an open collaboration to enable the interested user in designing and making their own clothes. The changing workshop concept invites participants with the assistance of skilled designers and sewers to gain knowledge and insight through a ‘hands-on’ experience. Neighborhood Labs aims at researching and supporting socio-material infrastructures (Ehn) on which urban collectives can evolve and operate on. The nucleus of this project is the Berlin neighborhood Fischerinsel, characterized by high-rise apartment buildings. The project questions whether design can foster civic engagement, break down communicative boundaries and deliver tools for changing the social and political situation. describes itself as ‘a framework that supports autodidactic activities, operating under the assumption that everything is in everything.’ It is a school with no curriculum, initiated in 2007 in Los Angeles in the basement of an exhibition and performance space called Telic Art Exchange. There are local chapters in Berlin, Helsinki, Vienna, London, Buenos Aires and other cities around the world. 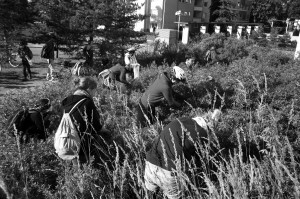 “The Harvest Map” is an ongoing mapping process of Helsinki’s public edible trees and shrubs. Anyone can give harvesting tips of yet undiscovered wild edibles to contribute to the map. 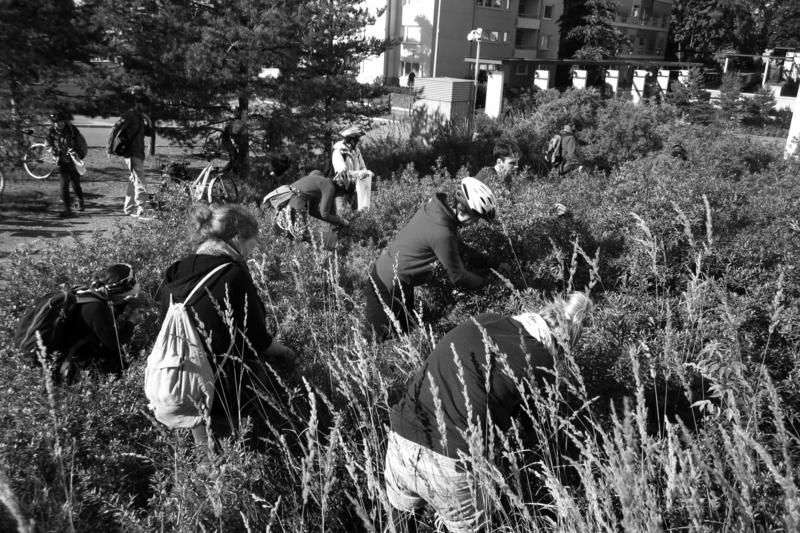 Urban foraging rides are arranged during fall where anyone interested can participate and experience the harvest together on a bicycle tour. is a ‘slow-working’ space in Berlin-Kreuzberg where people interested in the socio-ecological transition and the transformation to a sustainable society work and research next to each other. Tools for the Design Revolution was initiated by the Institute of Design Research Vienna (IDRV) in 2010 by focussing on the debate of sustainable design, with research projects, workshops and discursive formats, that finally accumulated in an exhibition project which was shown in autumn 2012 at the designforum in Vienna. The IDRV is a non-profit association, making an independent academic contribution to the establishment of design science. Since its foundation in 2008 by Harald Gruendl, this extra-university institute has worked on interdisciplinary strategies of knowledge production and mediation and focuses on research in the areas of sustainable design and design history. is an alternative, self-organized school that runs on barter. Trade School is for people who value hands-on knowledge, mutual respect, and the social nature of exchange, based on the belief that everyone has something to offer. The first Trade School started in 2010 in New York and has quickly grown into a network of more than 30 self-organized barter-for-knowledge schools across the world. was a 5-year-long interdisciplinary education- and research project in the Hamburg district of Wilhelmsburg. An empty, disused building was re-purposed into a diverse learning platform that became building site, stage, laboratory, interactive space and community center all at once, developing and testing contemporary forms of education based on culture, knowledge and urban development. workstation ideenwerkstatt berlin e.V. is a platform where projects and individuals can meet, exchange ideas and get advice and support at an international level. It helps people to bring projects and initiatives into being and build networks between them. It provides people with an “area of freedom” to think about new ways of life and new forms of work, supporting their development and implementation on both, the collective and individual level. ZEGG is an intentional community near Potsdam where around 100 people live together convivially as a living experiment that focuses on questions of communal living and ecological economic activities. By linking communal life with a training centre, they create a special combination of living and learning. is a young artist based in Santa Cruz, USA, who put together the Guidebook of Alternative Nows featuring art projects suggesting and testing alternatives to now. an urban designer and a sociologist both teaching at the HCU Hamburg. They were involved in the 5-year-experiment UdN University of Neighbourhood testing out new ways of living, teaching and learning. an artist, an art historian and an architect all involved in the self-organized learning project Public School.org. They organize and host classes based on no curriculum in the Berlin chapter of the international project. doctoral researcher and lecturer at the design department of Aalto University Helsinki in the MA program Creative Sustainability. She is an expert of the Maker movement (the topic of her dissertation), part of organizing Helsinki Green Drinks and Helsinki Green Maps and is involved in developing Lens, the Learning Network on Sustainability in Design. press coordinator and resident of the long-term intentional community ZEGG, the Centre of Experimental Cultural Design located near Potsdam in Germany. director and activist of the Berlin chapter of the civil society organization European Alternatives, whose mission is to spread democracy, culture and equality beyond the nation state. a writer and researcher focussed on the commons. David is, amongst many other book, author of the recently published Think Like a Commoner, of which he is sharing one of the chapters for this project. is a graphic and architectural interior designer who co-founded The Beach, an Amsterdam based network designing for social and sustainable innovation (they call it ‘sustainist design’) with projects building capacity in local neighbourhoods, dealing with contemporary social issues and a book project, The Sustainist Design Guide. a young artist from Spain who is running the Berlin-Kreuzberg version of Repair Café and is also involved with the non-profit organization Kunst-Stoffe e.V., where she runs workshops with children repurposing trash. a sociologist and an architect who acted as the co-editors of the Berlin version of the Community Lover’s Guide to the Universe, a collaborative book project that set out to collect local community projects in openly accessible online guides which can be printed and bought on demand. both organizers and activists who take part in running projects at the non-profit initiative workstation ideenwerkstatt e.V., whose main goal is to create new perspectives and opportunities of work in the system we live in. philosopher and sociologist whose writing is concerned with work, learning, feminism and Marxism. environmental artist, urban gardener, photographer and activist who initiated and runs the urban foraging project Satokartta, featured as a case study in this book. professor of Organization and Culture at the University of Leicester School of Management and co-author of the books Dictionary of Alternatives and The Companion to Alternative Organization, amongst others. is working at ‘Tactical Technology Collective’ as director of the Evidence & Action program, where she is working with a team on publishing tools and methods for visualizing data for advocacy as guidebooks, websites and events like the Info-Activism Camp. Her background is in research, writing and activism with a women’s rights organisations in India and internationally. both academics and authors of numerous books based in Australia. Valerie and John are concerned with the themes of collective thinking and the collective mind. Amongst their co-written books are the titles ‘Tackling Wicked Problems – Through the Transdisciplinary Imagination’ (2010) and most recently ‘The Human Capacity for Transformational Change: Harnessing the Collective Mind’ (2014). is a sustainable design educator, consultant, facilitator, writer and activist. Currently, he teaches and practices at Helsinki’s Aalto University as Professor of Emerging Design Practices, where he is focusing on ‘the socialisation of design(-ing)’, co-design and open design. is a graphic designer and initiator of the open-source fashion workshops Makeable. She recently graduated from the MA program Creative Sustainability at Aalto University and currently supports Emerging Design Practices with research and teaching activities. is a designer and organizer with a passion for socio-political issues, DIT-culture, food and open knowledge. She studied, worked and lived in Italy, Switzerland, Austria, Laos and Finland and is currently based in Berlin.